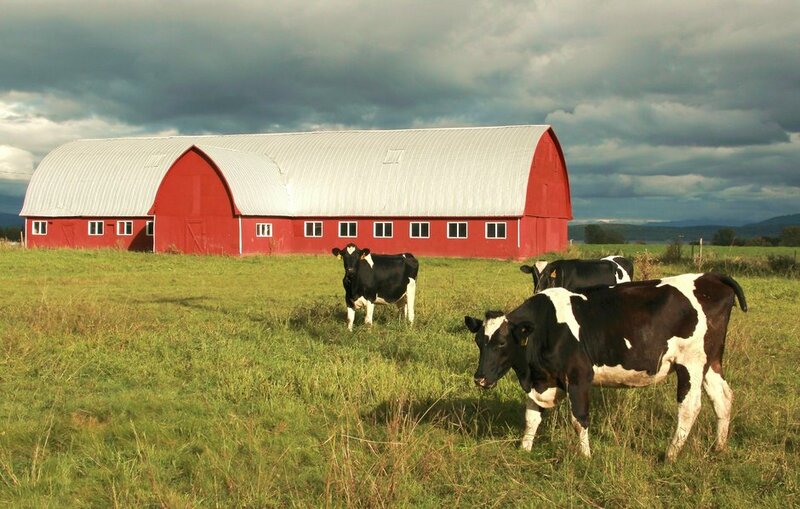 Farming, row crops, farmhouses, farm animals all have been on my mind lately. 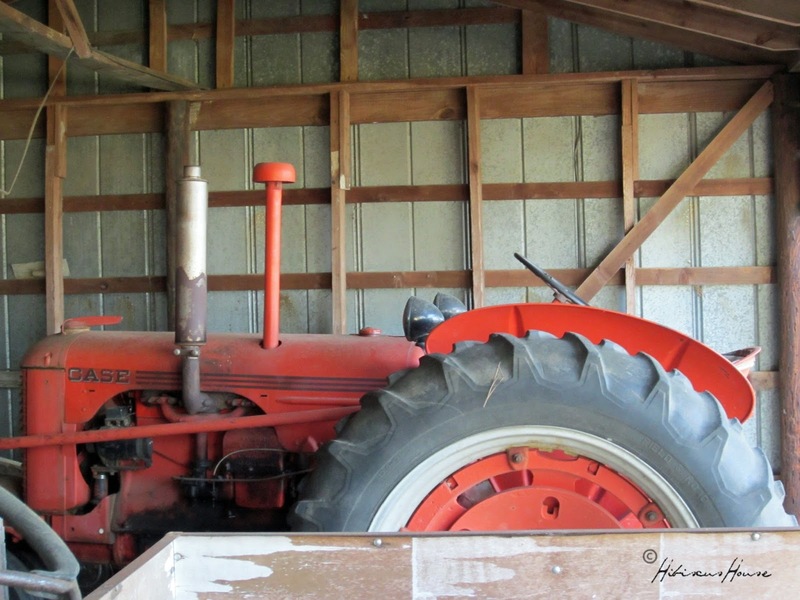 We lease this land out where we are to farmers, so when I hear a piece of farm equipment in the fields those memories come to mind. The following picture, although not the same, reminds me of one that my Grandma Goldie had hanging on her wall. She framed hers from an issue of Progressive Farmer. 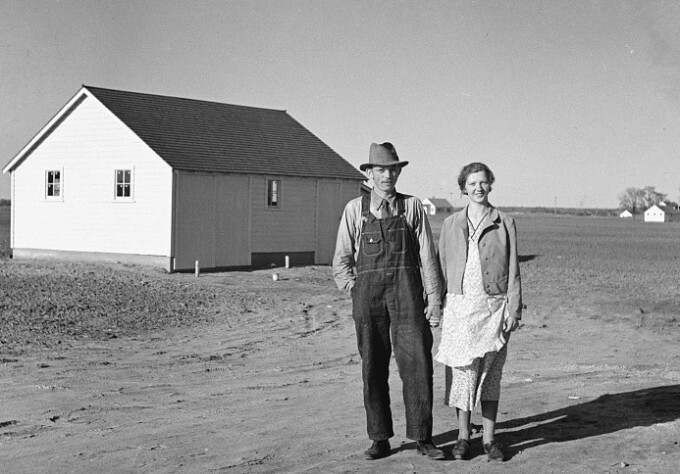 Farming was hard and the farming family had to take what they had and use it to the fullest. Now they were some of the best DIYers ever! Talk about re-purposing things! Today I share other's pictures because I have none of our family farm pictures. These will give you an idea of the true farm life in those days. The farmland above in picture is from Kansas and has statistics on that page that says 10% of farmland to change ownership by 2019. People are selling off their farmland to outsiders, those not related to them at a faster pace than in the past. Sad, isn't it? 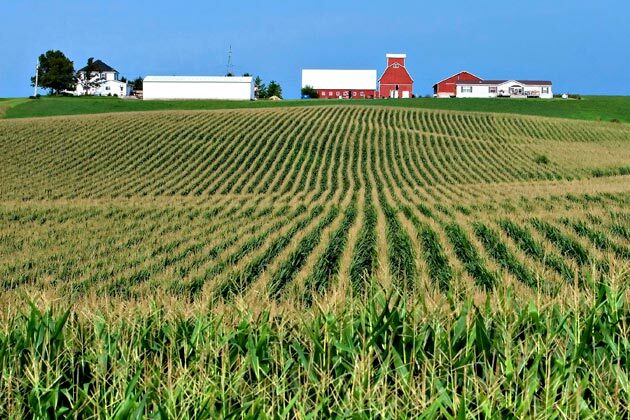 Land, the most important thing to have to farm, whether it is owned, sharecropped, or leased. Of course you have to have land! Farm equipment too like my family's tractor above in the picture of the old days. Now they farm with such huge equipment! This scene from Gone with the Wind has always stuck with me so I must share the video. 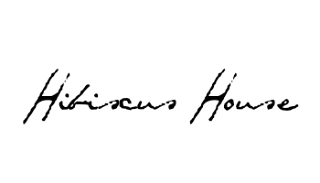 It says it all when her father is speaking to Katie Scarlett O'Hara about Tara, the land! You know this is my favorite movie of all time, right? "Land is the only thing in the world worth working for, worth fighting for, worth dying for. Because it's the only thing that lasts!" There were barns for housing/milking animals and fenced in areas for grazing as well. Many a time we children bumped up against an electric fence. It gave us a jolt for sure. But oh how we loved to watch the animals. The barns were beautiful! 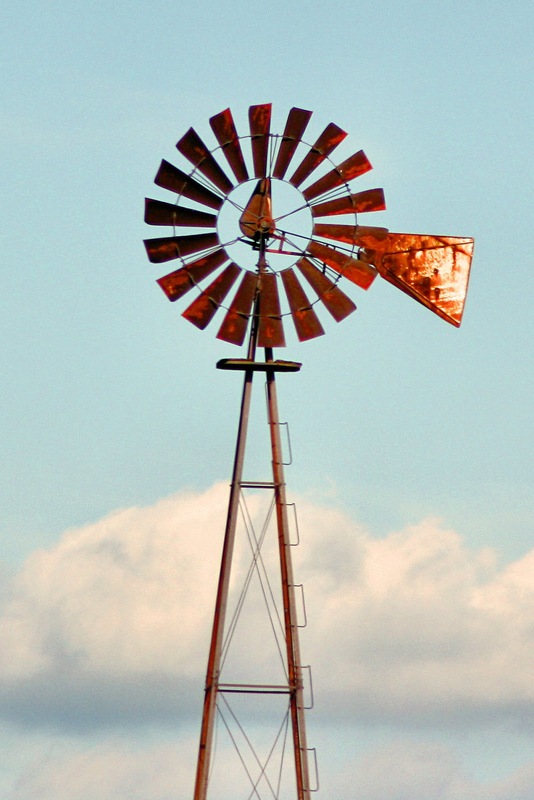 I remember well the windmill that one set of grandparents had on their farm for supplying some of their watering needs. We children would run around and play in the area. I can remember just standing there watching that thing move and work! It was amazing to me for sure! 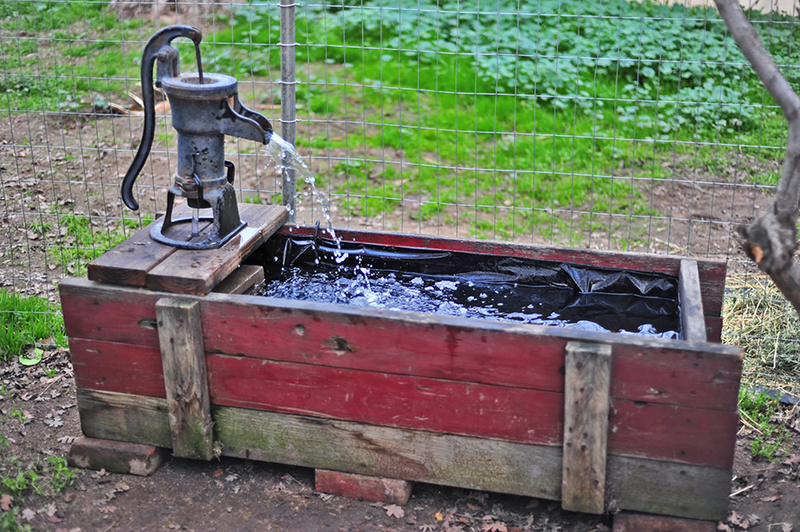 This handpump and trough looks like one that my grandparents had next to a fence with farm animals. It was located in the same area as the windmill. Made for easier watering of all the cows, pigs, chickens, goats and other farm animals they had on that farm. I have fond memories of grandmother Johnson bottle feeding some of her baby animals. We visited our grandparents at least once a week during my growing up. There were five of us so we took turns spending a week at grandma's every summer. When I think about it now she and grandpa 'Goodson' certainly were troopers! There were other cousins that did the same so their house was full of family most of the time! Those were the times that inspired the true love of country farm living for me. Both grandparents had these on the farm, the tobacco barns. 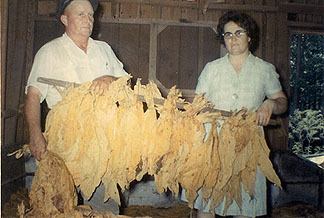 I spent many summers under them handing that sticky wet mess called tobacco leaves to the older girls and ladies. They were called 'The Stringers' and I aspired one day to be one of them. (How crazy was I)? 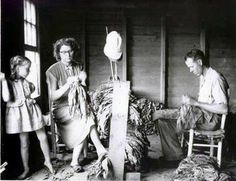 They would take tobacco twine to wind and string the green tobacco leaves onto tobacco sticks. Then they would put them into the barns that were heated to bake, cook, cure--dry the leaves. They fire cured the tobacco. I can still smell them cooking. I remember the grandpas going out in the middle of the night to check on this baking process. Excuse my child like explanations because that is all I know of it. Farmers feel free to comment and explain to us in correct terms. Tobacco now that is one crop I'm glad to never have to help with again, although I have wonderful memories of being on the farm and listening to the farmhands talk and laugh. The boys were all too excited to be able to become old enough to drive the tractor and pull the drag in with the harvested green tobacco leaves full for us to hand and string. One grandpa in particular would go to town and get Pepsis and nabs (cheese crackers, which were stacked in a count of 4 then) for us to take a break and all farm hands were plum excited each time they helped "Goodson". The Pack House Barn is where they took the cured/cooked tobacco leaves to be taken off of the sticks that they had been strung on. I did take-off some tobacco when little as well. It wasn't sticky at that stage and for some strange reason smelled very good to me. I did more of this on grandpa Johnson's farm. This is a tobacco stick strung with tobacco that has been cured/baked in the tobacco barn before taking-off of the stick. The leaves had to be loose, I think or did they tie it into a bundle I don't remember that well. Either way they had to prepare it to take to market where it would be bid on and purchased by tobacco buyers. Now I didn't get to go to market but once, being a girl the boys got to go and witness that process more. 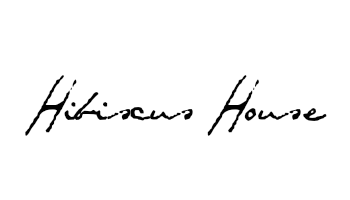 I love the farmhouse decor of today but the true farmhouse stands out in my mind and will forever be there. I'll share some of that today along with a touch of farming memories with you and compare the two. Let's take a walk up to the house! Farm wives kept it real, they really did! They kept clean, but very useful homes. Most all items that were in my grandparents' homes at least, were things they had to use to function. Oh, they had the few special sentimental items that were from family members but most everything else was used. Not many frivolous items were found. At the same time I remember one grandmother, 'Goldie', having a formal dining room and living room. Nice formal dining room set with stained wood buffet, sidebar and more. In the living room she had a velvet sofa and chair with more formal coffee and end tables. She had a 'figuring brain' I was told by many and if there was a way she'd get and keep some pretty nice things. She was a seamstress as well look at her dress. This house below favors one she lived in for years and years. 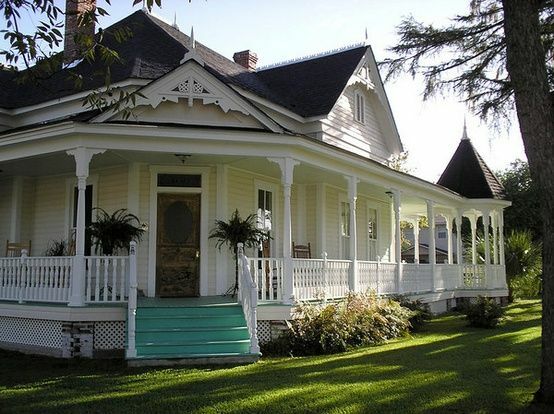 Both sets of grandparents lived in homes with the wonderful wrap around porches! I absolutely loved the wrap around porches they had on that home! Many hours were spent running around, swinging and playing on them! They loved them because they gave added space and mainly relief from the heat of the house. 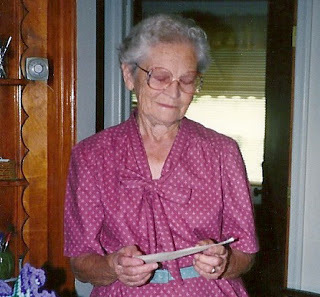 Grandmama Cora in her apron! Grandmama Cora used her back porch for her wringer type washing machine so plenty of work went on out there. You can be sure that aprons were part of the decoration in that home kitchen. I just called them decoration which isn't accurate, they were necessities for keeping their clothes clean underneath. Anyway, they had plenty of them too or at least two at all times. One would be for everyday and one nicer one would be kept cleaner for Sunday wear. She told me this many times. Fabric was affordable and she loved to sew. Feed sacks were saved and used as well. Nothing was wasted in those days. They used all things until they needed repairing or replacing. Farming was indeed hard work and didn't pay a lot. I recall seeing their farm journals (little notepads) filled with information. Supplies, labor, costs, net profits etc. 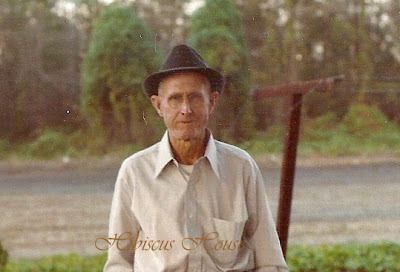 Yep, my granddaddy 'Goodson' wore overalls and was a very hard worker. People would come by and see him in his ditch weeding. They'd say, "That Goodson is the cleaningest man I ever did see!" They were right of course everything was clean! The only time he would take them off was on Sundays. He took his bath on Saturday night and put on his best as did they all, Sunday clothes, then. Granddaddy 'Goodson' in his Sunday best! Times were harder and my grandparents, although a few years earlier, had gone through 'The Depression'. Those were especially hard times. I do believe they would say to me "We had it better than most! We raised what we needed with the exception of sugar, we had to get rations for that." They grew some sugar cane I do remember, maybe it wasn't enough? Farming was a hard back breaking life and still is today although with new resources it seems a little easier. All farming depends on many factors, that is one thing for sure! In earlier years this would be the source of water that had to be pumped and taken into the house for use. I do remember my grandparents having one of their back porches and some of the best water I ever tasted came from those handpumps! Notice the tin bucket and enameled pan. Those were staples in homes back then! 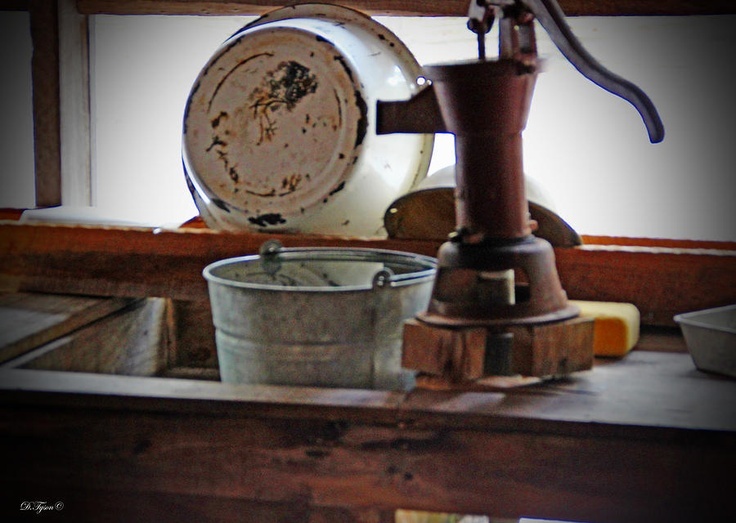 They spoke often of the colder, better water that came from these pumps! 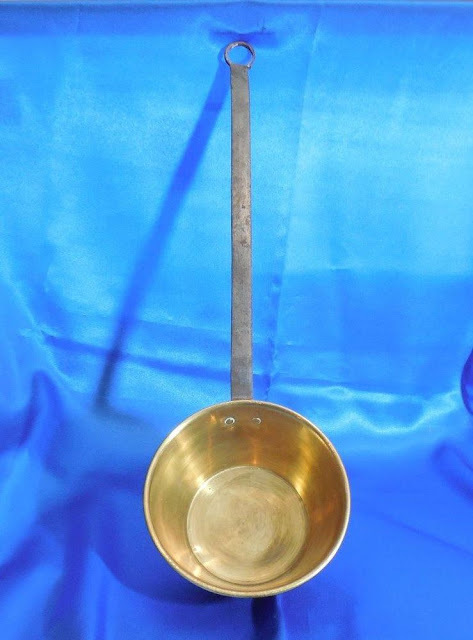 Now, this well used and by all mind you item the dipper as it was called, the water ladle. I couldn't imagine how everybody would use the same one, and over and over again. I declare I don't know how they stayed well and actually they were pretty dern strong health wise. It took something major to take them out. Maybe that's the secret? I don't know. This type of kitchen sink had to be loved by them because that was after the indoor plumbing came in. Can you imagine having this after having to go outside to pump and carry the water inside the home? What a blessing it must have been to have water with the turn of a spigot, (faucet we now call)! My grandmother Johnson had one of these I remember well. My mother in law Genolia had one as well and used it forever. I could never tell if I loved that thing or hated it. I now believe I would love to have one. Lots of farmhouses had one of these. They stored staples and had a flour sifter on the left top. I know that was convenient. In fact, if mine wasn't so rusty I'd use it today! Ours from my side of the family and it sits in the kitchen today. 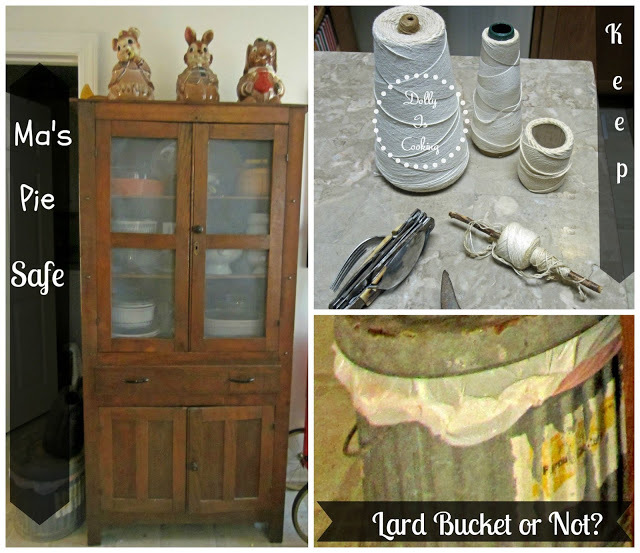 You can read all about it here in this post done called: The Traveling Hoosier Cabinet. I'll straighten and share what I have inside one day. I see where I left my gardening shoes, mistakenly when taking this picture a few years ago. That is keeping it real! I know that most all homes around here had one of these. I have one as well from my grandma it is in the dining room closet full of memorabilia from those old days. These were built in our small town called Timmonsville. Beautiful pieces that hold so many memories of baked biscuits, pies and cakes. Most of all of the women who owned and used them. I really like this pie safe and we use it daily in our home now! Chuck just told me the other day his grandmother 'Ma' was going to throw it away. He rescued it and I'm so glad he did. 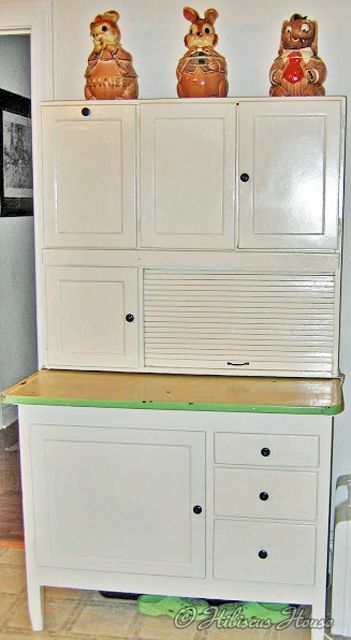 Some decor ideas that I remember from the "true farmhouses" are: Kitchen tables handmade and painted favorite colors or from paint they had at the time. Most of them I recall had at least at one time or another been green. Weathered with time and worn from lots of use, the kitchen tables come to mind. Those kitchen tables had seen lots of good home cooking and been the spot for many good conversations for sure. This table brings to mind the kind of tables some of them had. 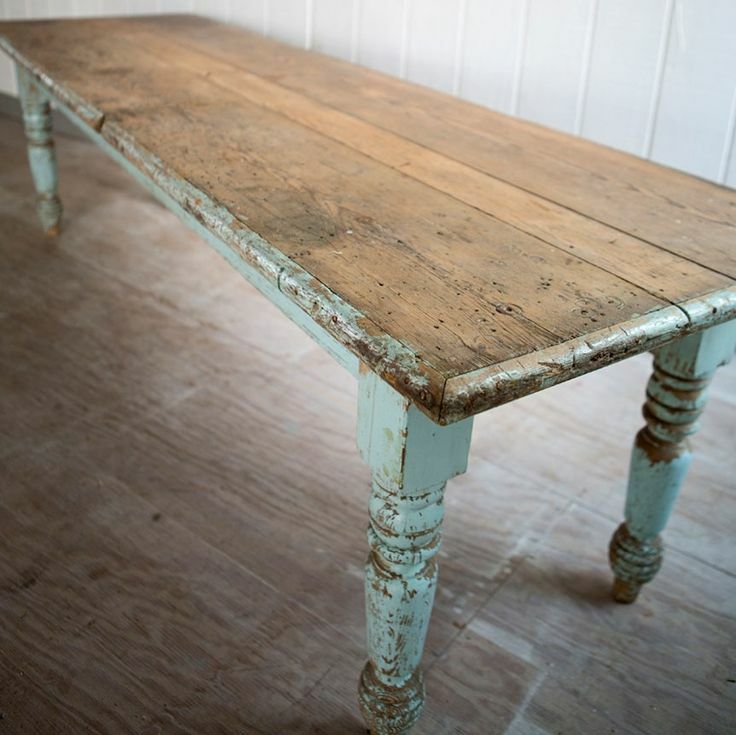 "Nowadays" people make new tables to look old like theirs did from use. I remember handmade wooden kitchen tables that were once all painted worn from use. This one found online brought back those memories. The kitchen tables of the past were simple and useful. I say the past they have certainly made a comeback due to shows like one of my favorites Fixer Upper! Next up metal table and chairs from the fifties like this set above. I do remember them having these in their kitchens including our home. 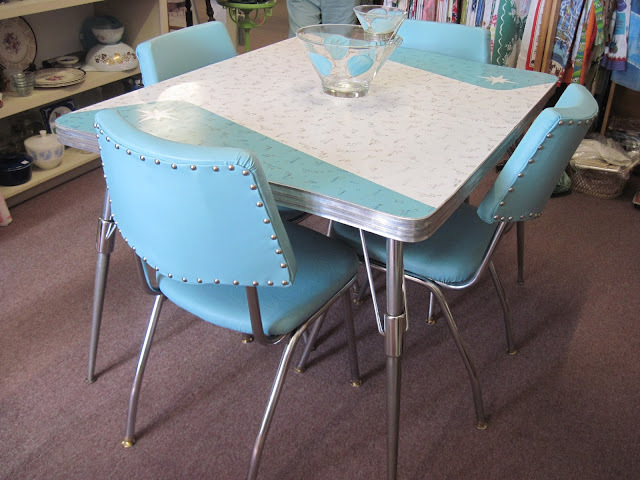 I don't remember all of the colors of course but I loved these tables. I remember days when there was no bathroom inside. The bathroom was an outhouse outside. I know some of you remember this as well. At my grandparent's home we took a bath in a tin tub. You can read all about that here in this post called: Traditions: You're Not Going To Make Me Wash In That Tin Tub! Most of the time these tin tubs were used in the kitchens where it was warm from the wooden stove or in good weather outdoors on a porch. This type tub came along with the new indoor plumbing! 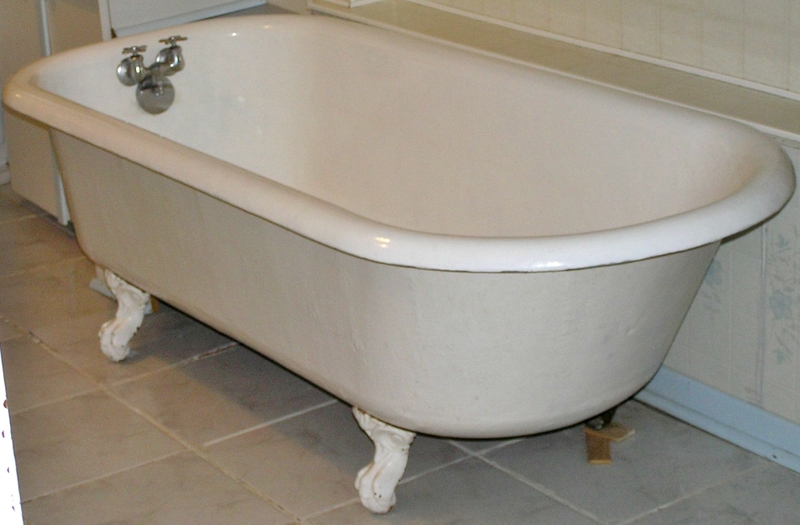 I took a bath most of my life in an iron Clawfoot tub similar to the one pictured above. This one seems to have a missing Clawfoot. I loved that bathtub. It ended up outside in the horse pen years later. These were used a lot back then. I'm glad mama and daddy kept ours well into our childhood years! The newer tubs just weren't the same. My mama's parents lived in a home and in fact she grew up in that home less than 2 miles from where I grew up and in this home was a bedroom that still had the newspaper wallpaper on the walls. We were extremely young when we would visit them there. I remember us trying to read the newspaper that remained on the walls. 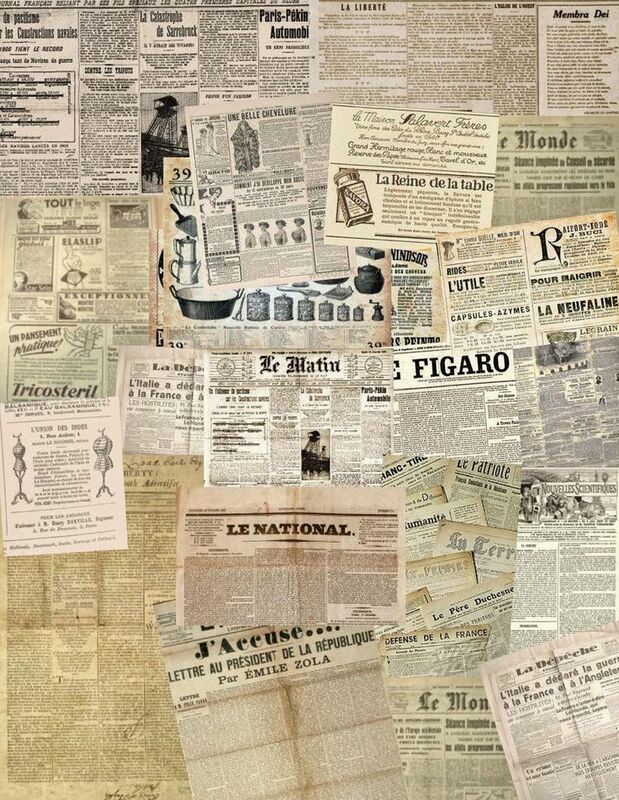 Now this is true farmhouse wallpaper. The other rooms walls were as our friends from "Fixer Upper" call it ship-lap. In fact all of these grandparents homes had the ship lap walls and wooden floors. In later years when linoleum came out the grandparents all put that on their kitchen floors! I 'll add some of the canning recipes maybe in the cook book to come. 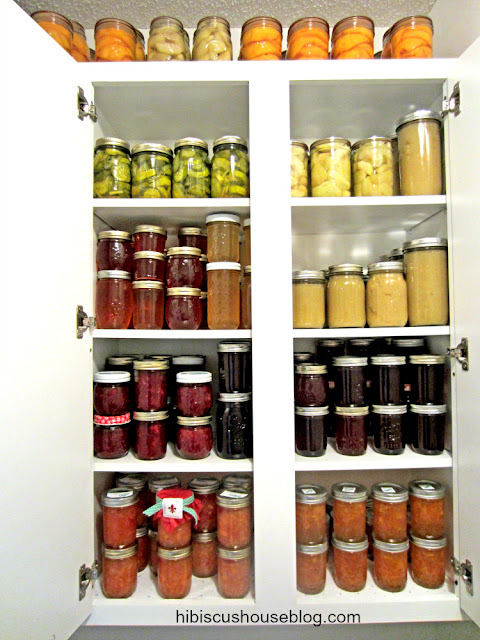 Canning jars were important and people were so thrifty during that time they held onto things and made the most of what they had. I somehow understand how they felt. This is my canning here at Hibiscus House and the intended purpose for the canning jars! I think the grandparents would be so proud of me carrying on their traditions! 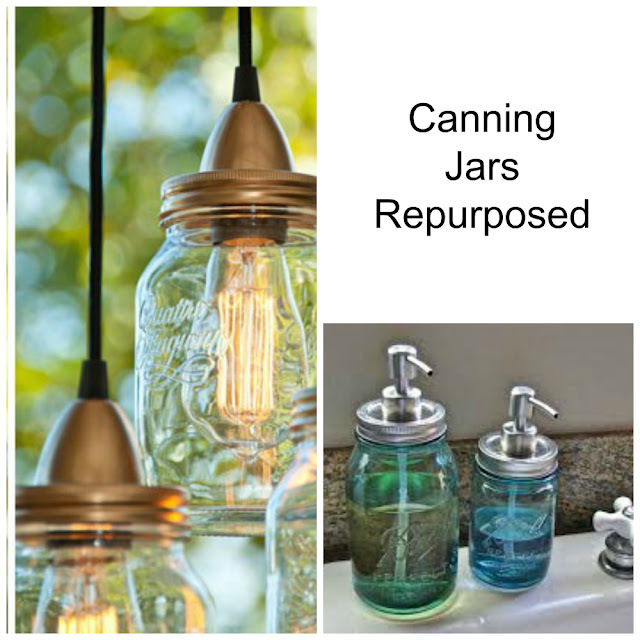 These above canning jars are really cute re-purposed, but I can tell you exactly what my grandmas would have said if we had touched their very important canning jars! "Get your hands off of my jars"! Most farm wives had some of these starched and on their fine furnishings if possible. 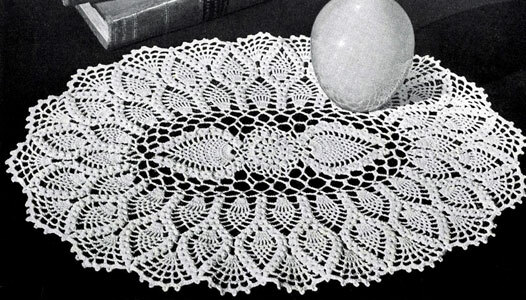 Both grandmothers had these beauties in their homes and spent quite a lot of time making and starching them. This would have been a true farmhouse decor item. I have a few of them stored from both grandmothers. They are delicate and pretty. 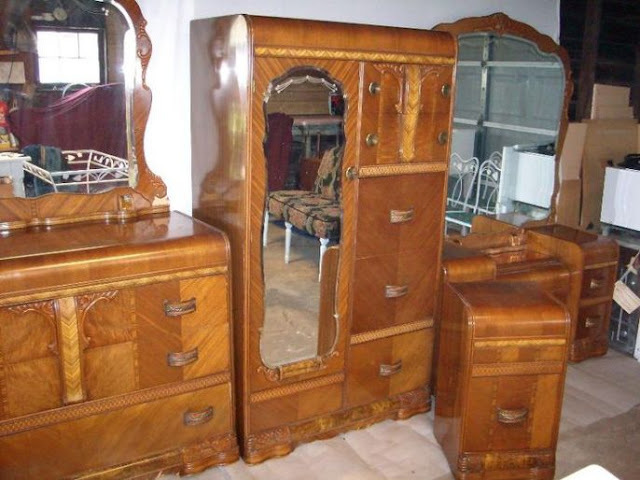 One set of grandparents had a bedroom suit almost identical to this one above. As a matter of fact I have it in storage. It is in bad need of repairing, and a project I hope to do one day. 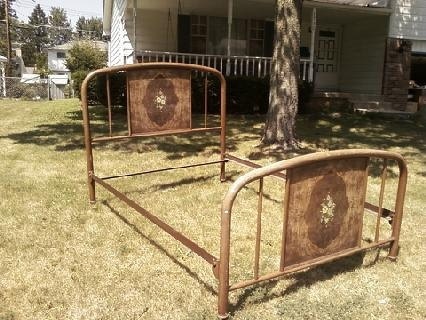 The grandparents had this type or similar wooden furniture and some iron beds as well. 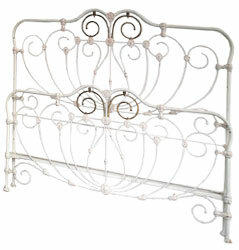 I always loved sleeping on those wrought iron beds with feather bed mattress covered with blue/white ticking fabric. Those flat feather filled pillows as well. You had to plop, hit and shake those light feather filled mattresses to get out of the hole from where someone else had slept before you. If someone was sleeping with you well, you both would be in the middle of the bed in one puddle. Good memories, believe it or not! You can bet that the farmhouse held many of these and they were well used. You see the older farmhouses had no heat. The only heat was in the kitchen where a wonderful wood stove was kept burning in cold weather and a constant supply of wood had to be chopped to even cook a meal or heat water for the house. One of my grandparent's homes had a wood burning heater in what they called the 'Heater Room', the living room, the sitting room. All other rooms were left unheated. Families would gather around in those rooms and enjoy each other's company and then run off to bed! Those bedrooms were so cold and people would cover their heads even with those then extremely heavy quilts! 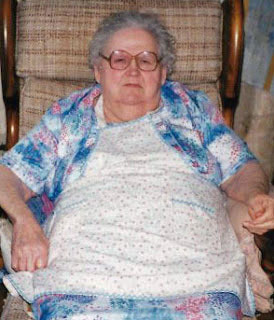 My grandma 'Cora' would make her heavy quilts from the denim of grandpa's overalls. They were worn out so she cut the good out of them to make them. Heavy corduroy fabrics, old flannel shirts were cut up and used as and added. 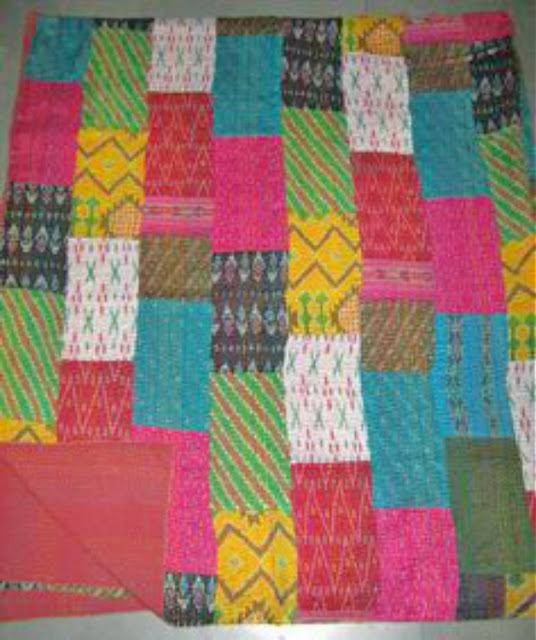 Most anything she had was added to those quilts. Eleven years or so ago when we cleaned up the farm road and stuck a house in the middle of the farm, we caused a little havoc to be sure. The farmer on the side said to us, "You ain't never gonna be able to get back up that road to your house, cause when it rains the road washes out"! He was right of course it has been a constant source of trouble for us from the very beginning. Now we just haul in rocks and drive around the new pot holes as they come up. The farmers that farm this land didn't think twice about spraying my newly seeded and for years afterward growing grass as well. I mean when they fly across the fields like my uncle did in a race car then it's time to slow down and actually direct that cancer causing grass killing chemical in a better way. Yes, you know I've told them many times about it. The pieces of farmhouse furniture that we inherited our ancestors were going to throw away! Yes, when asked about it they would say, " 'Antiques' what are you even talking about? This old stuff? Naw it's in the way, you want it you take it!" That is how they felt and now we treasure the items and the memories that we hold dearly in our hearts. The perils of putting your home right smack in the middle of a farm! Love it here and hope you've enjoyed my heart filled memories of grandparents, farm life, and farm decor. I know I wrote a book didn't I? Oh goodness. The memories that you brought back. 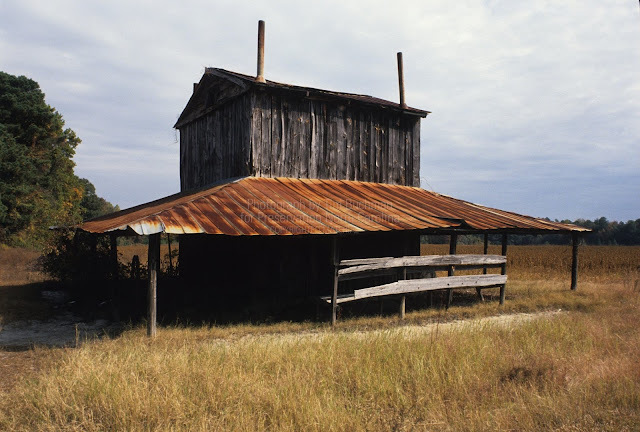 My granddaddy was a sharecropper in Hemingway. I, too, loved the smell of the dried tobacco. Still do to this day. Went to Grandaddy's every summer and stayed. My sister got caught on an electric fence standing in a puddle. Grandma told us the fence was off but thinking Grandaddy had turned it off. Oh the screaming for it to be turned off and the fussing at Grandaddy that Grandma gave him. Grandma and Grandaddy were beside themselves over it. Their place was one place you knew for sure as a child that you were loved beyond measure. We had many cousins to come, just like yours. They never played favorites and everybody pulled their share. Thank you for sharing. It really made my day. That was a GREAT "book" Dolly. Oh- I can relate to so much of that---from the heater room, to the old hoosier in the kitchen, to the cold, cold bedrooms, the wringer washer in the 'back room'. one part of our V drive that washed out in heavy storms, work aprons and "good" aprons, REAL shiplap walls that let the cold seep in all winter long and quilts made from old clothing and chicken feed bag calico. Oh Dolly I just loved everything about this post. I adore all the old photos and nostalgia. Thank you for sharing it. 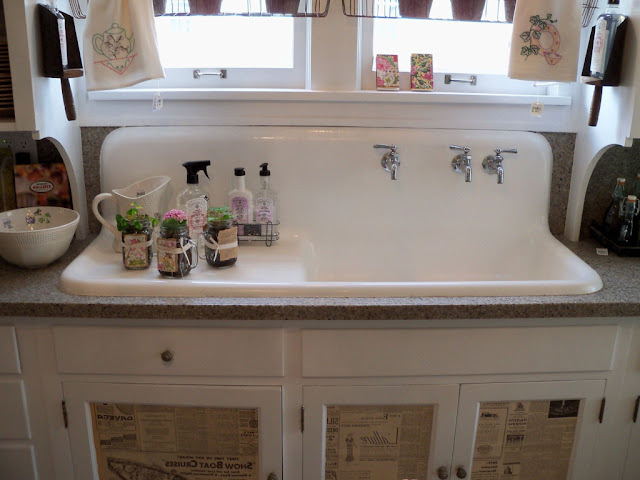 We have an old farm sink in the basement at the lake house. I LOVE it! I wish it was upstairs in the kitchen. I think if we ever sell that house I may have to rip out the sink and take it with me. LOL. Thank you so much! I'm glad you did and I do believe I'd have to take that sink with me too if I were you!